I've had to do a bit of redesign work on the layout of my 'meishi'. Internet website address - e-mail address - a new postal code from the Post Office - a realignment of my telephone number by NTT ... Everything's changed - but I haven't gone anywhere! I hope you will enjoy the stories in this issue. It's time for hanga no aki! It's not easy to forget those first days on the job at the music warehouse. It was a tiny place, about the size of a one-bedroom apartment, and was absolutely jammed with merchandise - the back room full of musical instruments in boxes, the walls of the front room invisible behind floor-to-ceiling shelves of sheet music. It was September, the height of the busy season for school suppliers, and orders were flooding in from music teachers wanting this piece of music or that. It was essential to be able to locate their desired selections quickly, but so much new stock had arrived over the summer that it had been impossible for the two employees to file it all, and the floor everywhere was covered with jumbled stacks of music, leaving only very narrow paths to walk. This was my first assignment from Bill, the owner. "See those piles of music? Sort them out!" When I asked where I should put the sorted music, I was told "Find somewhere!" Later, when a gigantic semi-trailer rig containing hundreds of musical instruments, enough for dozens of school bands, pulled up outside the door, Bill told us "O.K. guys. Get all this stuff into the back room." When we complained that the back room was full, we were told "Find somewhere!" Actually, this job very much suited me. I like having things in order, and I like puzzles, so the challenge of getting these jumbles properly 'squared away' was not the chore for me that it had been for the other employees. One incident from that first day sticks in my mind, and maybe Bill still remembers it too ... As part of my work with the sheet music, I had sorted a stack of band marches into alphabetical order and filed them on a shelf. At one point in the afternoon a phone call came in from a teacher looking for a particular march. Bill took the call, and I overheard what he was saying as he wrote down the order. When he looked up I was ready; without even going to the shelf I was able to tell him "We've got two copies, one by Publisher X, and one by Y." As it turned out, I was correct, and I think it was perhaps at that point that his second thoughts about hiring me started to disappear ... The next year or so was absolute heaven for me. It wasn't all mundane warehouse work. Once the chaotic autumn season was behind us, I found myself doing many interesting things: selecting the best music from among the reams of new publications that were sent to us and then recommending it to the teachers who were looking for advice, visiting schools to give flute 'clinics' and guest-conduct the bands, and travelling to many parts of the country to attend conventions and music industry meetings. At the time I started the job, I was a very shy and withdrawn little boy, but being thrown into these positions of responsibility and into situations where I had to meet people, forced me to start coming out of that shell. Our car runs along the Itsukaichi-kaido, and on both sides the tall 'keyaki' trees towering over the road give the route something of an old-fashioned feeling. Passing Koganei-bashi, we are soon in a quiet corner of Musashino, and a minute later, arrive at Yokota Kiyoko san's atelier. Stepping into the cozy room, we instantly feel a warm mood - completely surrounded by the products of her art, industriously produced one stitch, one stitch at a time. It is French needlework - and one piece especially jumps into my eyes from its resting place amid the many works with floral motifs. It is a panel of calligraphy, the needlework looking exactly like brushstrokes. I look closely at the detail, and see that the stroke order of the characters has been precisely followed - each overlapping brush stroke sewn exactly. 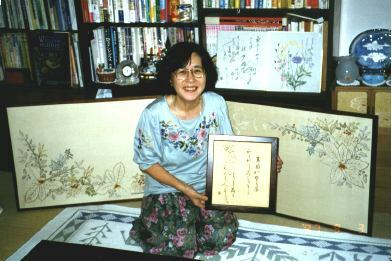 When we ask her where this unique idea of doing Japanese calligraphy in needlework came from, she tells us that she worked it out through a long process of trial and error. Perhaps some of you have done some needlework - you know how the thread is made up of a cluster of fine strands; she separates these strands and uses them one-by-one to produce this delicate work. And she would like threads even finer! While listening to this story, I came to see that Yokota san with her delicate 'calligraphy', and David with his carving, are actually pursuing something very similar. Where did the idea for her to do this type of needlework come from? We have to step back a bit to find out - back to Yokota san's school days. At that time, many young people were attracted to the work of the poet/author Herman Hesse, and she was one of these. The idea came into that young girl's heart to recreate one of his poems in needlework, at that time a very 'modern' avocation. Her wish came true. A calligraphy teacher prepared a tracing of the poem for her, and slowly but surely the work took shape. When it was done, she felt a strong desire to do more - and to learn as much as she could about this art. And this is what made Yokota san unique, I came to realize. 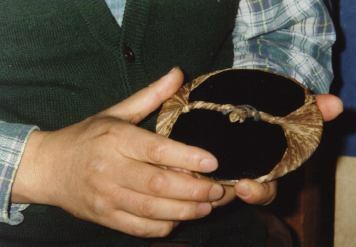 During the conversation, I noticed a nearby cupboard with needlework embedded on the door, and she opened it for us. Inside, the blue cases containing David's prints were carefully arranged, along with small boxes in which were stored his newsletters, essays and various newspaper clippings - yet another example of her methodical personality. Even now, as I sit here writing this, I can see in my mind's eye Yokota san sitting in her atelier - perhaps alone, or perhaps together with a group of students - her needle peacefully moving along. I was browsing through some back issues of this 'Hyakunin Issho' newsletter recently and came across a photograph that made me groan when I saw it. 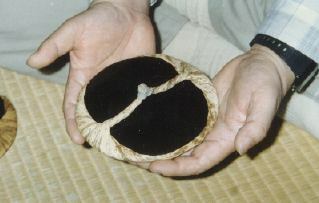 The picture was in a story about the baren-maker Gosho-san, and was a close-up of his hands holding a baren - my baren. The newsletter is from 1991, so I guess the photo was taken more than six years ago, and as I look at it now, I realize that Gosho-san must have been very embarrassed back then when he saw it in the newsletter. You see, although the baren itself is very well made, the bamboo skin covering has been tied very badly (by me, of course), and I am sure he was worried that everybody who saw it would assume that this was an example of his work! It is perhaps because of this that some of the experienced craftsmen I visit are quite sensitive about their tools. They do not like to have other craftsmen looking closely at them, and certainly not picking them up and handling them. I made a few mistakes this way in my earlier days in Japan, before learning something about how these men feel about tools. I thought nothing of picking up a knife, inspecting the edge, and then commenting on how sharp it was ... It just seemed like a natural and 'open' thing to do. Looking back now though, I think that they must have been angry with me, but were too polite to show it. Of course the knives were sharp! It was an insult to suggest that they could be otherwise. My own feelings on this have become mixed over the years. I do not pretend to share the same emotions as these well-trained 'shokunin'; I am, I think, more simple. If you want to look at my tools, go ahead. I know my work has room for a lot of improvement, and this makes me less sensitive to criticism. But even as I say this, I have to admit that I can't avoid feeling somewhat possessive about my tools, and if another craftsman my own age or younger were to pick up my carving knife and inspect the blade, I would feel a bit ... less friendly toward him. Many non-craftsman visitors come to my workshop, and the respect these people show for my tools ranges from extravagant to non-existent. When it sometimes happens that a visitor who has come to see my prints reaches out to pick up a knife or chisel, I remember my own curiosity years ago, and I merely warn them "Those are very sharp. Please be careful not to hurt yourself ... " But sometimes a photographer or TV cameraman with a desire to arrange a 'good' shot, gets a bit over-eager and starts to rearrange the tools on my desk, banging the steel blades together as he does so, and I have to change my warning to "Those are very sharp. Please be careful not to hurt them ..." This is unusual though, and most people are very respectful of the tools. 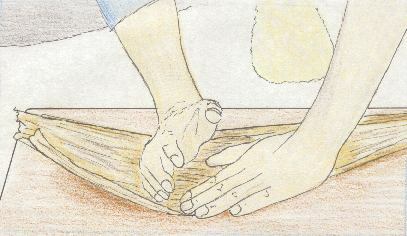 So my apologies go to Gosho-san for printing that picture, and please let me assure everybody that there is nobody ... nobody ... who can do the difficult job of tying the bamboo skin as well as he can. Here's what his tying job really looks like! During the printing process, the bamboo skin covering the baren soon wears out with the rubbing, and it must be frequently replaced. To an experienced printer, it is the work of a few moments, and is done without even leaving his seat at the printing bench, but for the relative beginner, it is a cause of great frustration. It is a delicate and complicated job - and if the bamboo is not tied tightly and neatly, the baren will be very difficult to use. Back in the days when that picture was taken, I was having a terrible time tying the skin. The one in that old photo is one of my better attempts! The problem for me was that while full-time printers do this re-tying job almost every day and thus soon become adept at it, my 'one-print-per-month' schedule meant that I was faced with this job only on far-scattered occasions, and thus never developed any fluency at it. As a result of this frustration, I constantly postponed changing the bamboo, and only broke down and faced the inevitable when the skin became absolutely too worn out to use. I would turn to the job with a heavy heart, and would inevitably spoil three or four skins before getting one tied in a way that would at least be barely functional. I dreaded the job. But after years of this kind of frustration, I realized that the situation would never change unless I tried something new. I made myself a promise that each time I tied the skin I would relax and approach it calmly and coolly - imagining that I was in a room surrounded by experienced printers all watching me work. I would try and move my hands the way that I know they would move - with smooth and quiet confidence. That was a couple of years ago, and it seems that this new strategy is working - my skills are improving, although very slowly indeed. My heart no longer sinks when it is time to change the skin. Although my tying jobs are certainly not as beautiful as Gosho-san's, they have definitely improved, and I am no longer ashamed when people see the baren on my tool bench. And perhaps ... just perhaps ... the recent improvements in my colour printing - the deeper and stronger colours - might have something to do with this. Perhaps! As I mentioned in the last issue, I have been busy recently preparing an internet website to display my work, and am now able to tell you that things are 'up and running'. 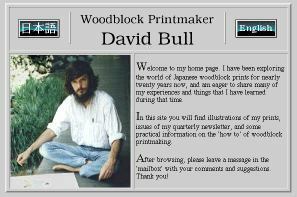 Those of you with access to the 'net can find me at the address: http://www.asahi-net.or.jp/~xs3d-bull. 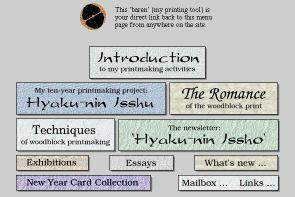 Introduction: This gives newcomers an overview of what my printmaking activities are all about, and contains a selection of press clippings. 'Hyakunin-Isshu' Woodblock Series: Each print in the series has its own 'page', where it appears along with its short essay. 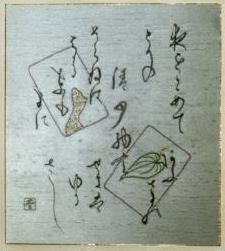 Of course most of the fine detail of the prints is lost when they are shown on a computer screen at such a small size, but at least viewers can get an introduction to Shunsho's designs. I have also created a series of pages where the prints appear in complete sets of 10 (in miniature size). 'Hyakunin-Issho' Newsletter: Here are all the back numbers of this newsletter. (As I write this, I haven't yet finished getting every issue loaded into the computer, but the job will soon be done ...) Any differences from the printed version? A few: the computer newsletter has photographs in colour, an index to make it easy to find any article, and all stories that are 'to be continued ...' are linked together for easy reading. In addition to these main sections, you will also find information on upcoming events, updates to the website, and of course a collection of links to sites of related interest. It has been a very good education for me, designing and implementing this project, and it has been a lot of fun. Since the website went 'online' I have received e-mail from viewers in America, Canada, England, Sweden ... all people who would perhaps have never had a chance to see my work. And now that they are computer literate, it seems that communication between us will be easier this year. I send them frequent e-mail (combined with photographs and voice recordings), and although they don't 'write' back as often as I'd like, I know that they are involved with a very busy and active life over there.